Researchers have sounded a warning over the much-feared disease glanders, saying the global horse trade from at-risk regions had the potential to re-establish it in countries that have previously eradicated it. The recent rise in cases of glanders in horses, in combination with worldwide horse trading, might pose a new risk for human infections, they said. Glanders is a life-threatening, notifiable zoonotic disease which can be fatal to both animals and humans. It is caused by the bacterium Burkholderia mallei. Signs of glanders include lung lesions and ulceration of mucous membranes in the respiratory tract. The acute form results in coughing and fever, followed by septicaemia and death within days. In chronic cases, nodules form on the skin and in the nasal passages, eventually ulcerating. Death can result within months, with those surviving acting as carriers. The only known reservoirs of B. mallei are single-hooved animals, particularly horses. Chronically infected horses can be asymptomatic but may remain highly infectious. Due to its high mortality rate and the small number of organisms needed to establish infection, it is regarded as a potential biological warfare or bioterrorism agent. Although glanders has been eradicated from many Western countries, it recently emerged in Asia, the Middle-East, Africa, and South America. Due to its rareness, little is known about outbreak dynamics of the disease. Researchers from Germany, the United States, Dubai and Austria set about investigating an outbreak among horses in Bahrain in 2010-11, using genetic analysis. They applied high-resolution genotyping and comparative whole genome sequencing to B. mallei isolated from infected horses and one infected camel. The results were compared to samples obtained from an outbreak in the United Arab Emirates in 2004, and put in context based on previously published B. mallei data. The researchers, whose findings have been published in the open-access journal, PLoS Neglected Tropical Diseases, found that the samples from the outbreak in Bahrain separated into two distinct clusters, consisting of five and four strains each. This, they said, suggested a complex background to the outbreak, especially with the evidence for the involvement of multiple B. mallei strains. The evidence in the Bahrain outbreak across both years pointed to two independent but simultaneous introductions. The samples from Bahrain were more closely related to B. mallei isolated from horses in the United Arab Emirates in 2004 than other B. mallei, which they said was suggestive of repeated importation to the region from similar geographic sources. “The close relationship of the Dubai/UAE B. mallei populations to each other may be indicative of a similar geographic origin that has yet to be identified for the infecting strains,” they reported. “Our analyses demonstrate that not one, but two strains likely caused this outbreak, and that these strains probably came from a similar geographic region via importation of infected animals. “Even with careful monitoring, the global trade of animals from glanders-endemic regions can re-introduce and possibly re-establish this disease in animal populations of countries that have previously eradicated it,” the researchers said. Glanders is a disease known from ancient times. It was recognized as a malady of equines by Hippocrates and Aristotle, the researchers said. B. mallei is currently feared as a potential biological weapon and has been used as such in the American Civil War and both World Wars to cripple equine military components. In the more economically developed countries, glanders has been eradicated through large-scale culling. In developing countries, economic and cultural circumstances may hinder culling of asymptomatic animals and enable the persistence of glanders, the researchers said. There are regions in Asia, the Middle-East, Africa, and South America where it remains endemic, infecting the likes of horses, donkeys and camels. These areas provide reservoirs for the re-introduction of glanders into countries previously listed as glanders-free, they said. In recent years, several outbreaks occurred in horse populations in Asia, the Middle-East (Afghanistan, Kuwait, Iran, Iraq, Pakistan, Syria), Africa, and South America (Brazil). Because of the recent rise in cases in multiple countries, glanders has regained the status of a re-emerging disease. Officially, Bahrain was free of glanders until an outbreak in the north that began in April 2010. 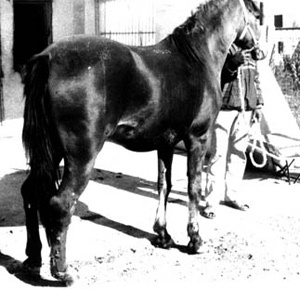 Horses imported from Syria via Kuwait were suspected of introducing it and all equines in the area were quarantined and tested. By September 2010, the outbreak was considered to be resolved. However, in January 2011 the disease reoccurred in the same region of the country. More than 6700 horses and 250 donkeys – all of the equine population in this region and about 80 percent of the total horse and donkey population in Bahrain – as well as three camels presenting with clinical symptoms were screened for glanders at the OIE Reference Laboratory in Dubai. In these investigations, 50 horses and one camel tested positive. B. mallei was isolated from eight horses and the single, positive camel. These were analyzed along with 15 isolates from the 2004 outbreak in the UAE. Using genetic testing, the scientists showed that the strain from the camel was genetically closely related to B. mallei strain known as Dubai 7 that was isolated from a horse during the contained outbreak of glanders in a quarantine station in the United Arab Emirates in 2004. That, and other results from genetic testing of various B. mallei isolates from both events – the 2004 UAE outbreak and the 2010-11 Bahrain outbreak – provided evidence that the recent outbreak in Bahrain was caused by two different B. mallei strains, suggesting two independent introductions. It may, they said, be indicative of a similar geographic source that has yet to be identified. The researchers said that outbreak dynamics and natural genetic variability of B. mallei were not well understood due to the rarity of the disease. “This outbreak provided a unique opportunity to understand outbreak dynamics as they occurred in a region that was previously free of B. mallei, and well monitored with records of animal importations,” the researchers reported. “The failure of initial eradication efforts in 2010 is evidence for the need for continued surveillance and abatement measures even after all animal cases appear to be cleared. Some of the research was funded by the US Department of Homeland Security. It had no role in the study design or analysis work.